Penguin Press HC, The, 9781594203206, 256pp. "Why are we attuned to the latest headline, diet craze, smartphone, fashion statement? Why do we relish a change of scene, eye attractive strangers, develop new interests? " "How did Homo sapiens survive near-extinction during an environmental crisis 80,000 years ago, while close cousins very like us have died out? " "Why is your characteristic reaction to novelty and change the key to your whole personality? " "Why do we enjoy inexpensive pleasures, like fresh flowers or great chocolate, more than costly comforts, like cars or appliances? " "How can a species genetically geared to engage with novelty cope in a world that increasingly bombards us with it? " Follow a crawling baby around and you ll see that right from the beginning, nothing excites us more than something new and different. Our unique human brains are biologically primed to engage with and even generate novelty, from our ancestors first bow and arrow to the latest tablet computer. This neophilia has enabled us to thrive in a world of cataclysmic change, but now, we confront an unprecedented deluge of new things, from products to information, which has quadrupled in the past 30 years and shows no sign of slowing. To prevent our great strength from becoming a weakness in today's fast-paced world, we must re-connect with neophilia's grand evolutionary purpose: to help us learn, create, and adapt to new things that have real value and dismiss the rest as distractions. 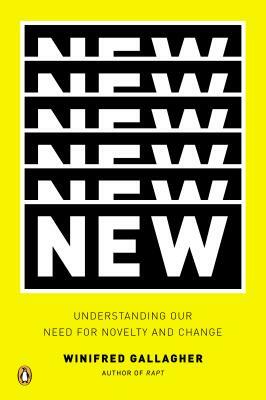 In "New: Understanding Our Need for Novelty and Change," Winifred Gallagher, acclaimed behavioral science writer and author of Rapt, takes us to the cutting-edge laboratories and ancient archeological sites where scientists explore our special affinity for novelty and change. Although no other species can rival our capacity to explore and experiment with the new, we individuals vary in how we balance the conflicting needs to avoid risk and approach rewards. Most of us are moderate neophiles, but some 15 per cent of us are die-hard neophiliacs, who have an innate passion for new experiences, and another 15 per cent are cautious neophobes, who try to steer clear of them a 1-5-1 ratio that benefits the group's well-being. Wherever you sit on the continuum, "New" shows you how to use this special human gift to navigate more skillfully through our rapidly changing world by focusing on the new things that really matter. Winifred Gallagher's books include "Rapt: Attention and the Focused Life, House Thinking, Just the Way You Are" (a "New York Times" Notable Book), "Working on God," and "The Power of Place." She has written for numerous publications, such as "Atlantic Monthly, Rolling Stone," and "The New York Times." She lives in Manhattan and Dubois, Wyoming. "A bright look at our fascination with the new and different. Gallagher (Rapt: Attention and the Focused Life, 2009, etc.) examines how we deal with the ever-increasing amount of novelty and rate of change in our lives. ... Gallagher points to the age-old remedy of moderation and notes neophilia will undoubtedly prove valuable in a future where the only certainly is constant change. Engaging and cautionary." "It's difficult to categorize Gallagher's exuberant survey through so many areas of interest, but she proves her point: curiosity about and hunger for the new can certainly take you to many fascinating places." "An accessible, well-researched work that crosses a variety of disciplines and will satisfy scientifically curious readers. It will appeal to those who enjoy Stephen Jay Gould and Oliver Sacks."